Ola cab offer Rs 200 wallet credit to all of its new users.If you never use Ola cab before you will get Rs 200 worth credit at no cost. Ola Provides Cab ride in many cities like Delhi, Chandigarh Chennai, Hyderabad, Kolkata etc. 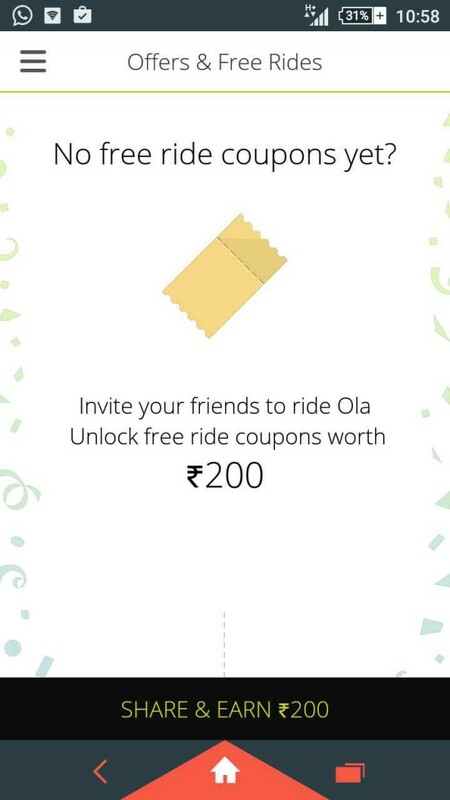 Ola cab also started refer and earn offer in which when you refer your friend to use ola cab you will get Rs 200 Ola credit for free.It is win-win situation for both , you will get Rs 200 credit for referral and your friend will get Rs 200 credit as a joining bonus.If you are not a part of ola family this is the right time to start. Now Ola is Giving Free Ride Coupon instead of Ola Wallet Credit like previous offer. Use those coupon while booking rides on Ola. 3. Register using your email ,full name and mobile no. 5. Remember you will get 200 Rs wallet credit only when you use this code. 6. Refer your friends and when they take their first ride on ola you will also get Rs 200 wallet credit in your ola wallet. 7. Enjoy your 200 Rs Free Ride Coupon in your account for free. 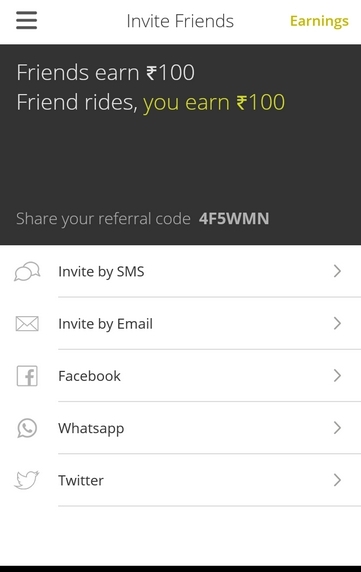 49 Responses to "Ola Cab : Free Ride worth Rs 200 [ Refer and Earn]"
Don’t get 200₹ I only get 100₹ from ur refferal code. simply install parallel space . using that u can use multiple accounts of every app on the same device. enjoy free ride guys..
Use this refral and eran 500 in ola cabs ride now.